Canadian metal band Voivod, returns in 2009 for their new release. Infini is a classic example of when the whole is better than the sum of it's parts. As a full album, Infini delivers, but upon close securitization Voivod falls a bit short. A large issue is the vocals and lyrics. Singer Snake switches between a carbon copy of Lemmy from Motorhead and a sing/speak that sounds like he took the armadillo out of his trousers and stuck it in his vocal chords. Lyrically, each song tends to repeat itself. I found myself thinking 'Yes! I understand the name of the song is God Phones!' as I listened to the first track. However, Voivod rises above this and gives the listener a very well produced experience. Every song is very tight and well put together, with vocals matching the music and plenty of riffs (really good ones too!). As said before, the first track 'God Phones' would be great if the phrase 'god phones' wasn't repeated literally 42 times. 'Earthache' contains the best guitar solo on the album and a great riff to boot. Other great riffs can be found on 'Global Warning' and 'Deathproof'. The album closes with 'Volcano', a seven minute long track that could not have ended the album better. 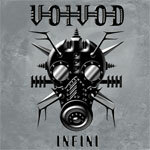 Voivod overcomes most of the shortcomings on Infini but some still seem to poke through. The album doesn't focus as much on 'prog' but more on 'metal'. For better or worse, this change provides a good listen.